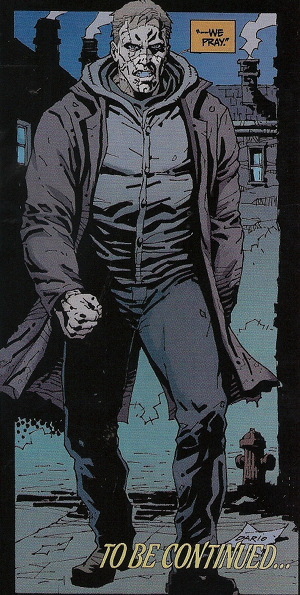 The world of movies and comics have both had their massive shares of versions of Frankenstein’s Monster, and sometimes they mix as comics have been made based on the films, like Topps adaptation of Mary Shelley’s Frankenstein and even Dark Horse Comics’ adaptation of the Universal Frankenstein. 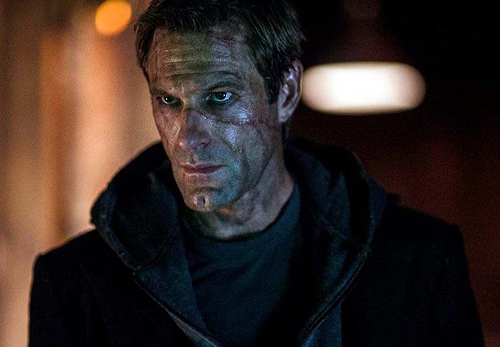 On this From Horror Movie To Horror Comic update we will be taking a look at a comic from Darkstorm based on the 2014 film I, Frankenstein that stars Aaron Eckhart as Adam aka The Monster. It’s amazing how this classic character created by writer Mary Shelley in 1818 has lived on through the decades and has grown and been shaped into many different versions, from normal looking human all the way to a giant deformed creature and everything in-between. 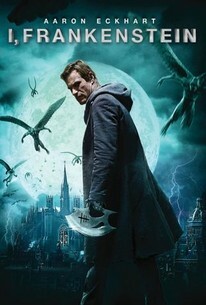 So let’s head down to the lab and hope for some lightning as we take a quick look at I, Frankenstein in film and comic. 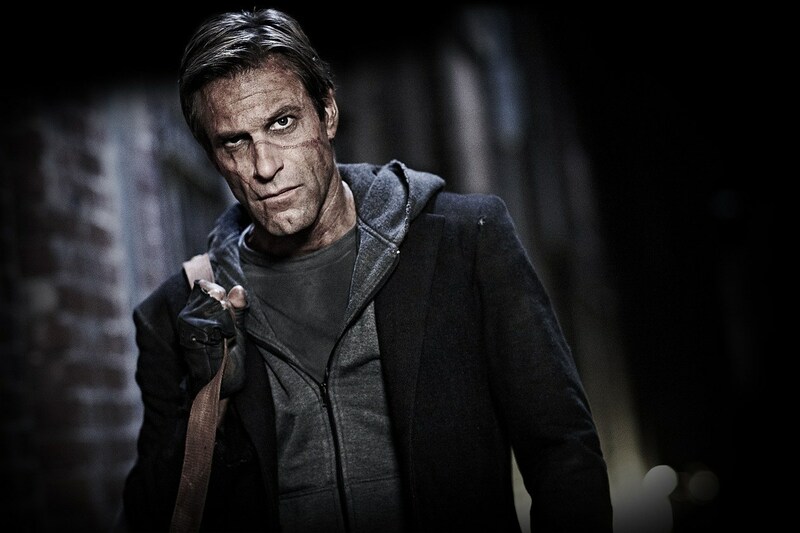 Let’s take a look at Adam and who and what he is in the I, Frankenstein universe. His creator Dr. Victor Frankenstein made Adam when he stitched together corpses in 1795 and after being disgusted by his new creation he tried to kill it, only for Adam to return and take the life of Victor’s bride Elizabeth. After Victor froze to death trying to get revenge on Adam, his creation buried his one time master in the family cemetery and soon finds out that demons want him as they think he holds the secret of bringing life back from the dead. They want to make an army of soulless bodies possessed by demon souls. Adam is taken in by the gargoyles that give him powerful clubs, and he finds out that they are the enemies of the demons. Adam spends a large part of his life hiding from them, and after years in hiding, he decides to take the war to the demons. Adam is super strong and skilled with clubs that make demons burst into flames. He is also smart and can use his wits to come up with game plans to attack his enemies as well as get his own fat out of the fire. While soulless, he has the want to learn and even shows compassion for humans and hate for demons and even gargoyles alike. Adam’s go to for killing are his clubs and blades that are made with silver as well as his fists. His brute power makes him a powerful foe to any man or creature that gets in his way. Adam also has an alliance with the gargoyles who will fight by his side against the matters of evil. His weakness is his rage as he can rush into things and doesn’t think them out. He can also be hurt just like a human and this means he can also die like one. Another weakness for him is he can feel love as well as loneliness, and this leaves him open for matters of the heart. While he has only killed two humans, he has killed a massive amount of demons and his not afraid to fight making him a man (or is that creature?) to reckon with. So know that we know what Adam is about and why he is alive and filled with attitude! I think it’s time that we now take a look at the film, and as always our friends at IMDB will supply us with the film’s plot and I will share some little facts and information about it as well as my thoughts on the film. The film was released in theaters on January 24, 2014 by Lionsgate and was directed by Stuart Beattie, who had only directed one film before this, the 2010 film “Tomorrow, When The War Began.” It starred such actors as Aaron Eckhart, Yvonne Strahovski and Miranda Otto and was sadly not a winner at the Box Office in America and beyond, only bringing in a total of $71,154,592.00 on a budget of $65 million and ranking at # 108 for the year only beating out other cult horror films like Devil’s Due, Vampire Academy, Tusk and The Pyramid showing sadly that this classic monster had lost steam with movie goers. The film’s score was done by Reinhold Heil and Johnny Klimek and is well done and is something that I play on the Sunday night WYSO show Alpha Rhythms. The weekend that the movie was released to theaters Juliet and I went to see it on that Sunday, and while not many other moviegoers where in the theater with us, we both found it very interesting and entertaining and for my Matt Goes To The Movies 2014 update I ranked it at # 5 out of the 11 Horror Films I saw that year. 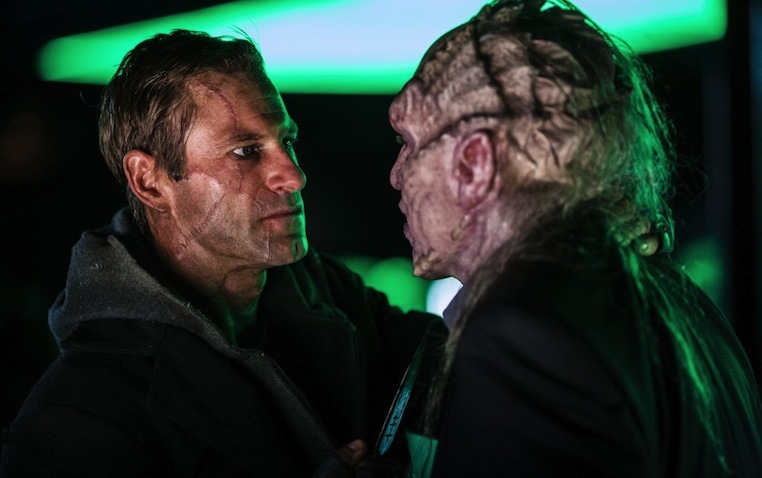 Aaron Eckhart does a great job as Adam and while he has some nasty scars, it is funny how his hair is perfect and his height is only a little over 6 foot tall making him one of the shortest Frankenstein Monsters I can remember since the likes of Robert De Niro! The producers of this film were the same people behind The Underworld series and at one time the rumor going around was that I, Frankenstein and Underworld were going to be mixed in a film that would have had not only Frankenstein’s Monster but also vampires, werewolves, demons and gargoyles for a monster battle royal of blood and pain! But with the film’s poor showing at the Box Office, the idea fell into developmental Hell and was just scraped. The film has been released on DVD, Blu-Ray and Digital and has gotten a small following on the home media market. So while this film is not as popular as other Frankenstein motion pictures, it is an entertaining one that I enjoyed and am looking forward to reading this comic. If you have not seen the film, I would say check it out if you like your horror mixed with action. 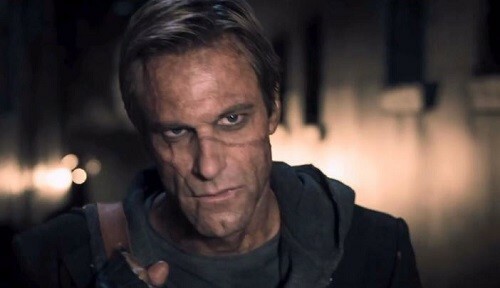 I, Frankenstein was made for comics as creator Kevin Grevioux who originally had this story as a graphic novel idea that was made into a film thanks to the folks at Lionsgate and would get a comic based on the film by Darkstorm Comics. So as you can see this property was very much a comic heavy one that is shocking that it never got the respect as other Grevioux series have achieved. I want to thank an Ebay seller who had this comic in stock so that I could do this update. I also need to remind you all that I grade these on a star scale of 1 to 4 and am looking for how well the comic stays to the source material, its entertainment value and its art and story. So if you’re ready to walk alongside Adam as he makes his leaps from the movie screen into the pages of this comic, we should get into the review. Karlos and Miriam of The Order are in the Alps keeping an eye on Adam aka Frankenstein’s Monster as that is their job to watch him and report if he is in any danger. They soon share some stories, and the first is about Prince Naberius the ruler of the demons who rose to power in England in the 1100’s when he was able to take over the body of a Templar Knight named Charles Wessex who was a traitor to the church and God and was sentenced to be hung for his crimes. But upon escape, he made a deal with Naberius who possessed his body and became powerful and after the one time ruler of the Demons is found to be a traitor Naberius kills him and takes his place as ruler and set his sights on findings Dr. Frankenstein and his secrets of creating life. Back in present day, The Order members back at the home base share the story of Leonore the Queen of the Gargoyles. Her story starts in 1621 when she was a young warrior for the Gargoyles. After a mistake that left one of her fellow protectors dead, she was exiled from her tribe only to be found and trained by Ezra from another tribe who took her under his wing. She returned to the Gargoyles and told them of the Demon’s plans to use humans in their attacks so that the Gargoyles would fall from grace for taking a human life. After a big battle with the demons and saving human lives, she was made their Queen. The Order then goes on to share a story about Adam and how way back he fell in love with a blind woman named Rachel and that the Gargoyles wanted him to just follow them to their base and not live his own life. When demons find him, they attack Rachel and Adam goes crazy and kills the demons and soon finds that Rachel is also a Gargoyle, and they set him up to show that he is selfish! Back in present time Adam has arrived into the city and The Order prays for his and their safety! This oversized comic was a perfect release to go along with the movie as it breaks down the backstories of the three major characters from the movie and makes you care about why and how they became the creatures they are in the film. The comic’s plot has The Order following Adam in the Alps all the while they are sharing stories about Adam as well as the Demon Prince Naberius and the Gargoyle Queen Leonore while Adam is heading into the town below. Adam is quite and mission driven in the modern setting and in the past seems lost until he thinks he has found true love in Rachel, the blind woman who in turn is just bait to make him feel terrible about himself as the Gargoyles keep calling him selfish. Leonore is shown to have been an amazing warrior who had the extra sight that allowed her to save lives and the souls of her fellow Gargoyles. Leonore is also very interesting as she was put down and called names as those warriors above her thought she was nothing but a coward when in fact she was the purist and strongest one of them all. And it showed that Prince Naberius has been obsessed with the idea of finding the secrets of Dr. Frankenstein so that an army of soulless demon possessed beings can be created and rule the world and kill off all the Gargoyles. I also like that when his body has grown old, he chooses a new one that is a corrupted Templar Knight! Oh man, this comic should have had Adam fighting the Blind Dead…ha! 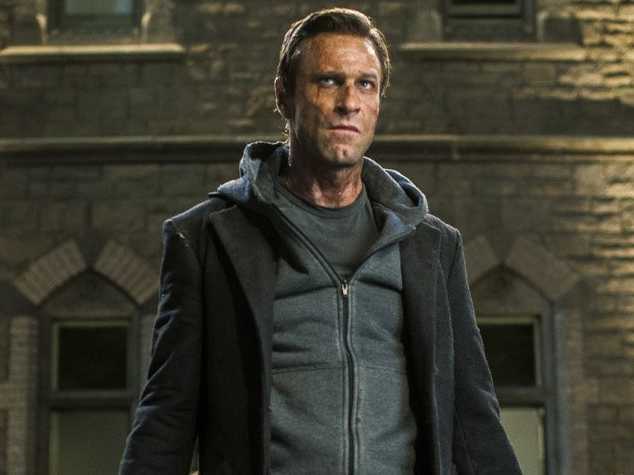 I know that makes no sense in the I, Frankenstein universe, but it still would have been cool. I really liked the format of this comic as each person’s story had a different artist on it and each had their own style and feel making it really seem as if the different storytellers of this issue had different ways of sharing the legends and stories. The cover is eye catching and is sure to please fans of the film. The only downside to the cover is the large print of the film’s release date. The comic has many artist attached and are the following: Dario Carrasco did the wrap around story and his style is solid and reminds me of early Dark Horse Comic stuff. 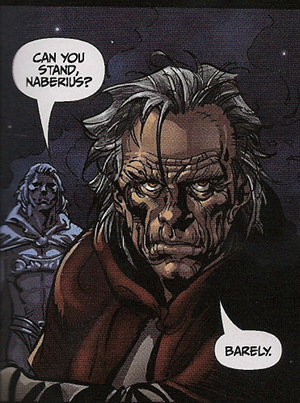 Roberto Castro handled the pencil for the Prince Naberius story and his style is good and reminds me of Topps Comics. Edu Menna was the artist behind the Leonore story, and it’s fantastic and reminded me of a more tame Chaos Comics style. And lastly and my least favorite art style for this issue was done by Ryan Benjamin and to me it just seems a little too sloppy. While it’s not terrible, it’s just not the style I like. Over all this comic that acts as a prequel to the film is a great read and truly does help add a new layer to the world of I, Frankenstein. While this is not the best Frankenstein comic book I have ever read, it is a really good one that Horror Comic Fans who like action mixed with their horror should check out. Take a look below for some of the art styles from this comic. 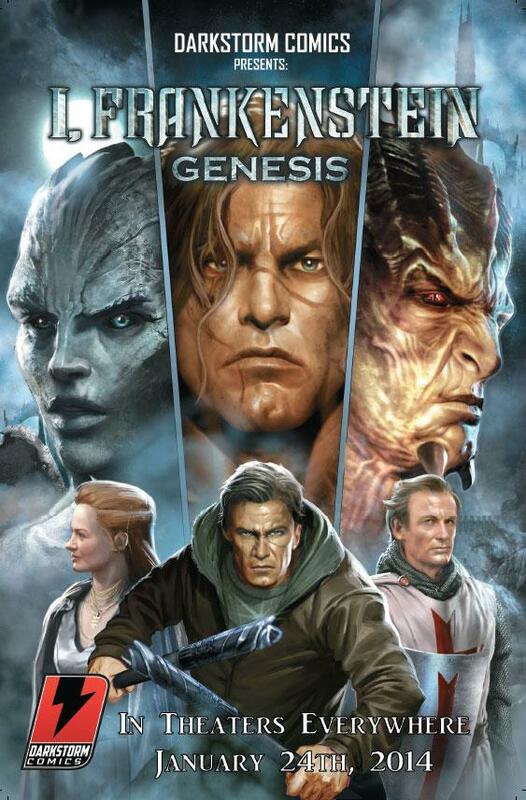 I, Frankenstein would go on to get his own limited comic mini series that from what I can gather was only released digitally and that’s a shame as digital comics lack the soul of the physical and left this Horror Comic reader not reading it. But while we leave Adam and his quest to defeat demons, we are staying in the world of Horror Films for our next update. While it’s not a comic based one, it’s something that is an event that me and my friends have always loved doing as well as something I have chatted about here at Rotten Ink on many updates as I feel it’s time you get The History Of The Horror Movie Marathon! So make sure to come back for that one as it’s a tale of VHS, DVD and amazing friends all enjoying the horrors of the small screen. So until next time read a horror comic or three, watch a horror movie or two and as always support your local Horror Host! See you for the marathon!